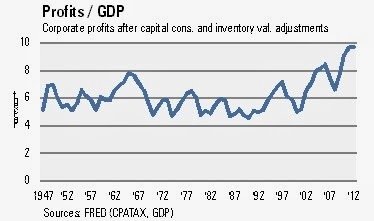 EconWeekly: Corporate profits: how far above norm? Corporate profits: how far above norm? Are U.S. corporate profits near a cyclical peak? By a popular measure of “profit margins,” they appear to be. But looking a little more carefully, one finds a simple explanation for at least part of it: the globalization of U.S. corporations. Corporate profits as a ratio to Gross Domestic Product (G.D.P.) is often presented as a macroeconomic proxy for profit margins (Figure 1). Some analysts wield charts like this to show that profit margins are much higher than the norm. I agree that the time series appears to be at a cyclical extreme. But this ratio is incorrect at two levels. First, corporate profits divided by GDP is not the profit margin per se. Secondly, and crucially, it blurs the distinction between magnitudes in domestic terms versus national terms. A profit margin is commonly defined as profits divided by revenues. G.D.P. is aggregate expenditure in the economy, which is definitely not equal to aggregate corporate revenues. It is reasonable to expect that profits as a share of GDP and profit margins are correlated—but they are not the same thing. A meaningful ratio would instead divide profits, which is the income of corporations, by total income in the economy. This new ratio I interpret as the share of total income that goes to corporations: no the profit margin, but the profit share. My second point is that the number in the numerator of the “profit margin” on that chart (Figure 1) comes from national income figures. It includes profits generated by corporations with legal residence in the U.S., regardless of whether those profits came from U.S. operations or foreign operations. This measure of profit includes income earned by Amazon in the United Kingdom, and excludes income earned in the U.S. by Toshiba. Gross Domestic Product (G.D.P. ), on the other hand, captures economic activity within U.S. borders, whether it is done by U.S. companies or foreign companies, and excludes activity by U.S. companies abroad. It is misleading to compare these two magnitudes: worldwide profits of U.S. corporations and GDP generated within U.S. borders. One can correct this mistake. The Bureau of Economic Analysis (B.E.A.) provides time series on national profits as well as on national income. I have collected the data and constructed a time series of the national profit share: net national profits divided by net national income. 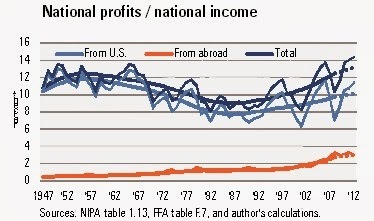 To gain some insight I also display the domestic portion of national profits and the foreign portion. (This breakdown is available on the Federal Reserve’s Flow of Funds table F.7.) The three series are displayed on the chart below (Figure 2). 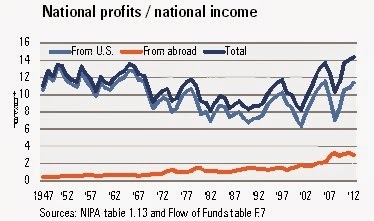 Total profits are at all-time highs, but foreign profits explain part of that. The share of profits that U.S. companies obtain from abroad is increasing. The rise has even accelerated in the first decade of the 21st century. Between 1990 and 2000, for instance, the share went up by 0.1 percentage points; between 2000 and 2010, it increased by 1.5 percentage points. The share of profits obtained at home, on the other hand, does not have an obvious trend. That foreign profits are growing as a share of national income implies that the “normal” profit share is not necessarily a fixed number, such as 6%, but a slowly rising number. And if “normal” profits are higher than the historical average, then the cyclical correction may be smaller than expected, or less imminent than presumed. To be more specific, I have estimated the trend of my two time series, foreign and domestic, of the profit share. As of 2008, the last year for which I estimate the trend, the “normal” (i.e. trend) profit share was 12.5%. If since then it had continued rising at the same pace as it did in 1988-2008, as of 2012 the “normal” profit share would be 13.2%. The actual profit share was 14.4%: still too high, but by 9%, but 70% as Hussman says (Figure 3). If profits kept growing, corporations eventually would gobble up the entire nation’s income—which means that labor would earn no income at all! My intention is not to say that profits can grow forever. But in the short term the U.S. share of global profits could keep rising. If so, the ratio of U.S. profits to national income could rise as well. Grantham’s statement applies to global profits in the long term, not to every country’s profits, or to the short term. Will foreign profits of U.S. corporations keep rising in the short term? I don’t know. But I don’t know that they will not keep rising—and Hussman and Grantham don’t know either.